If you follow my blog, you know I love white space. All the white space! Today's card for the MFT Countdown has lots of it combined with a FUN new die set and stamp set. For this card I am using the new set called From the Heart and the new die set called Hearts in a Row-Horizontal Die-namics. I folded a card for a card base and then rounded the top 2 corners. Next, I used some washi tape to hold down the heart die and then ran it through my die cut machine. Next, I added in the black and white striped paper from the new Black and White Stripes paper pack. Last, I used the banner dies from the die set and cut a piece of Ripe Raspberry. I heat embossed the sentiment from the stamp set. This stamp set is so much fun because it comes with lots of sentiments that go together with that adorable little heart stamp for the middle. 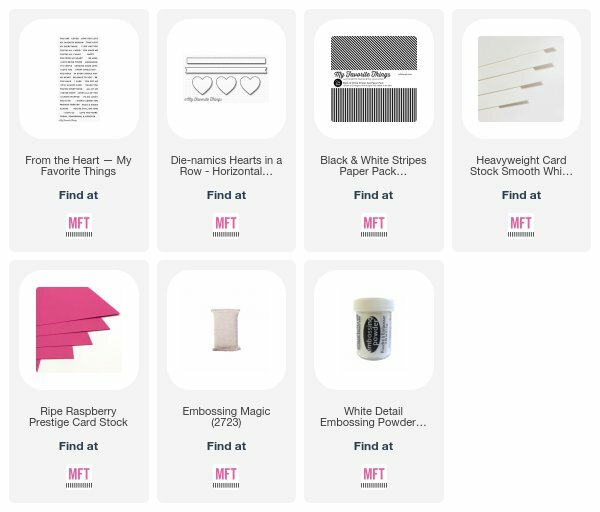 There are lots more stamp sets to see so go check out the MFT Blog for more sneak peeks. Everything you see will be available on Tuesday, January 9th at 8pm CST. I hope you'll come back tomorrow for another countdown day! Have a great day! That’s such a perfect Valentine card ! Gorgeous simple design - so classy! OOOHHH! LOVE all that white space too! So awesome! Awesome new stamp and die sets! I love your bold B&W stripes with the pink, AWESOME! Just love the classy look of the heart die card. And so easy to recreate. thanks for sharing your talent! 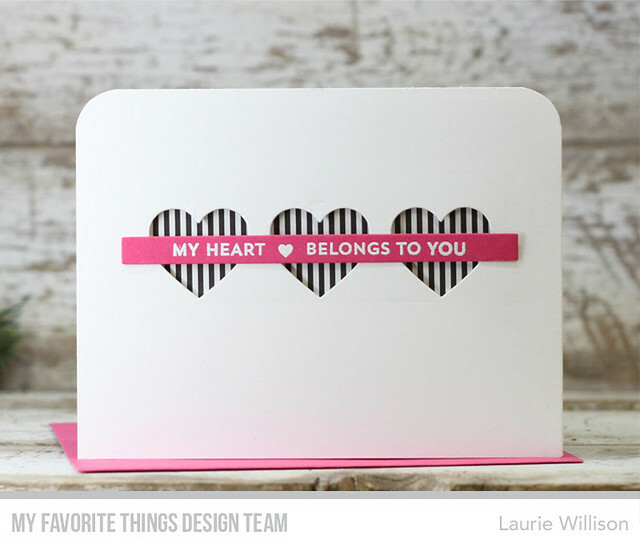 Oh, those stripes...love this Laurie!! This is so pretty with the pink banner across the heart cut outs. Amazing CAS design!Very pretty card!